What is DXC (Direct Extractor Connection) ? Direct Extractor Connection (DXC) is a HANA Data Provisioning tool which utilizes the existing BW Datasource. SAP HANA DXC can execute after a time interval as it is batch driven data replication technique. 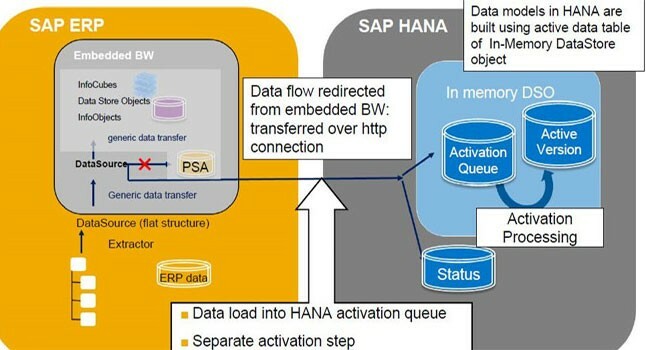 Existing ETL (Extract, Transform, and Load) method of SAP Business Suite Application via an HTTPS connection are used by SAP HANA DXC. For SAP Business Warehouse in SAP Business suite application content, Data Source Extractors have been available for data modeling and data acquisition. Sidecar variation: It uses the standalone Bw system as the DXC system. BW on HANA: In this option, if we have a non-BW schema in the same HANA instance where data must be loaded where we can consider the BW on HANA as DXC system. No additional server or application in the system landscape is required. The complexity of data Modelling in SAP HANA is reduced, as it sends the data to SAP HANA after applying all business extractor logic in the source system. SAP HANA Implementation timelines are done in a speedy way. Semantic-rich extracted from SAP Business site and are provided to SAP HANA. DXC does not provide real-time data replication option. Pre-define ETL method should be there in the Data Source, if not then it should be defined. A Business Suite System on Net Weaver 7.0 or higher (e.g. ECC) equal or below SP level is required in SAP DXC: Release 700 SAPKW70021 (SP stack 19, from Nov 2008). In Data Source a procedure with a key field defined must exist.